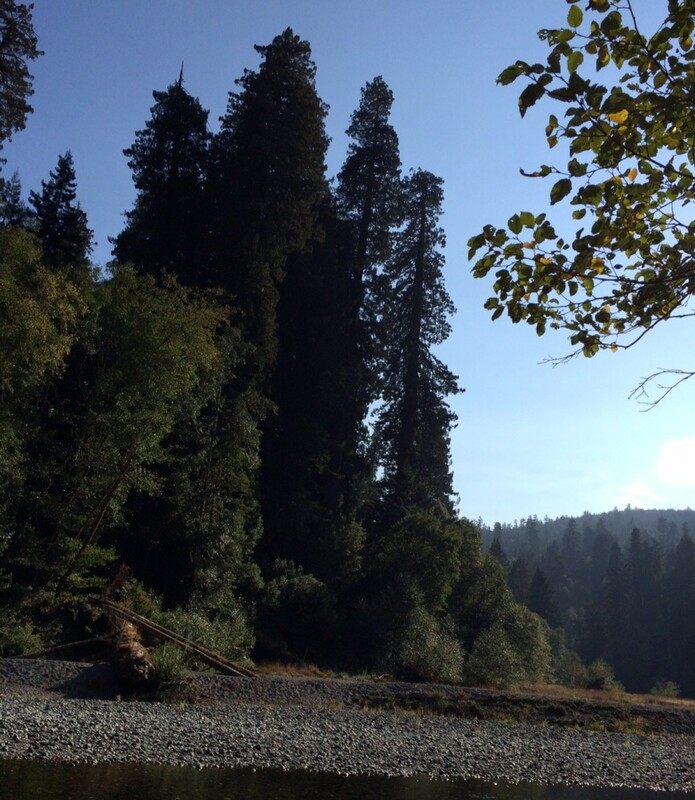 What sets coast redwoods apart from other tree species is their great height. It is the only species with extant trees over 100 meters in height, and there are 3,000 – 5,000 such redwood trees. And around 1,000 of these trees are in Humboldt Redwoods State Park (HRSP). 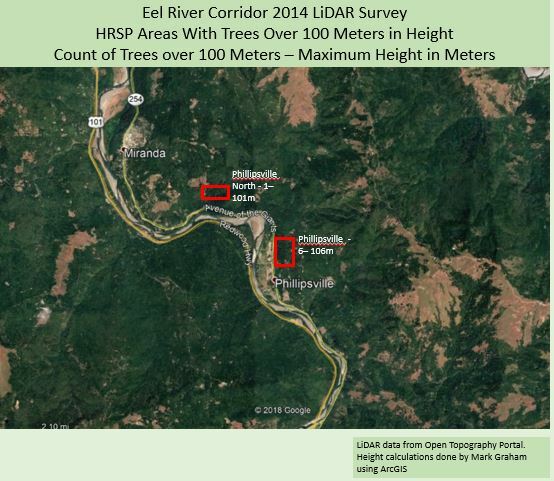 The 100 meter redwoods in HRSP are of course concentrated along Bull Creek and nearby Eel River groves. But surprisingly there are 100 meter redwoods in many areas of Humboldt, from the very northernmost area to the very southernmost area. 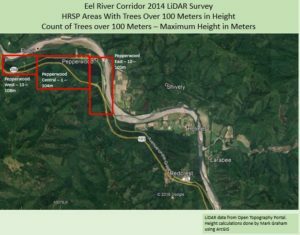 A 2014 Eel River LiDAR survey generated point cloud data which can be used to determine tree height by subtracting ground heights from first return heights. There is existing software with built in functions to do the heavy lifting. The point cloud data was recently put on the Open Topography Portal. I went ahead and downloaded twenty of so subsections of this point cloud data and reviewed tree height in the groves along the Eel River and Eel River south fork. As part of the review derivative maps were created which profile the canopy by height. For example, this is the road going into Founders Grove from the Avenue of the Giants. The purple indicates 100-105 meters in height. You can see there is a 100 + meter tree at the entrance, then another taller one on the right side of the road right where the parking lot starts. So this level of specificity can be reviewed throughout the park. 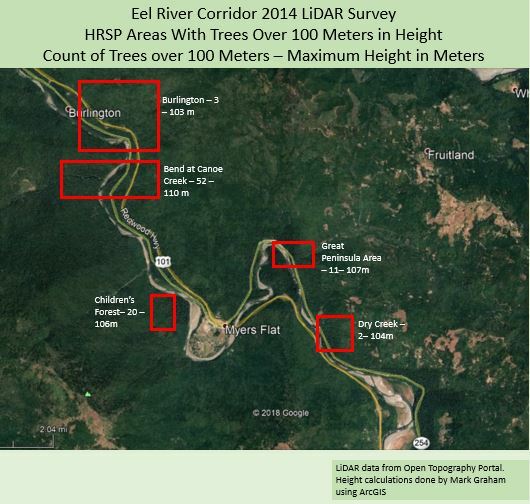 This table is a tall tree recap of the areas of Humboldt Redwoods included in the 2014 LiDAR survey. Most have 100 meter trees, some quite a few. 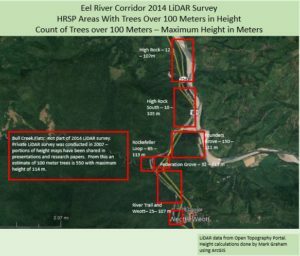 I also included a column for the number of trees between 90 and 100 meters. To do this work I just counted crowns by height band on the derivative height maps I created. The counts are approximately right but I am sure could be off by a little bit (but not by much). Rather than showing the derivative maps I made four overview maps of Humboldt Redwoods. 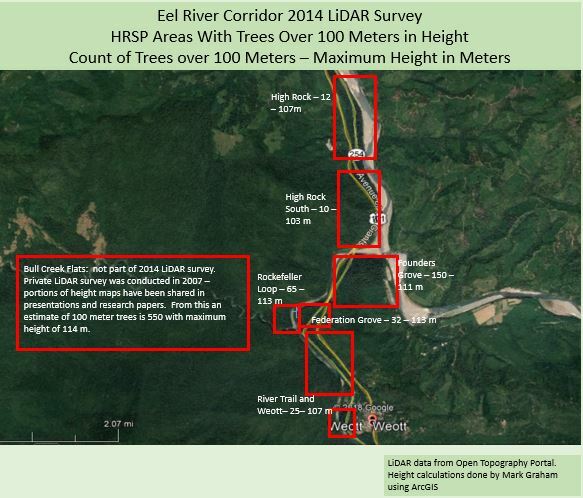 I hope you enjoy them, they provide a good general overview of where the tall trees are. The Pepperwood area has a few 100 meter trees, including one that is quite tall. Most of the tall trees in Humboldt are along Bull Creek or in the river groves near the Bull Creek outflow. Although Bull Creek was not included in the 2014 LiDAR survey, there are other sources for that area with partial information. So the counts for Bull Creek are estimates. There are also quite a few tall trees along the river south of Bull Creek. Then Founders Grove, Rockefeller Loop, and Federation Grove have many tall trees. Here way at the south end of the Avenue there are still a few tall trees. Also not shown is the Redway area, where there is one 100 meter plus tree. Doing these maps has me interested in visiting some areas of Humboldt I have not been to. One trail in particular is the River Trail from Bull Creek south to the Garden Club Grove. It is supposed to be very scenic. Its sad to see how most of the largest swaths of alluvial flat land along the South Fork Eel river are deforested. Weott, Myers flat and other places seem like ideal locations for some exceptional groves.